The methanol economy is catching on (see earlier blogs here and here) and David Milsteins group at the Weizmann Institute of Science recently opened up a new avenue for research. The topic: the catalytic hydrogenation of methyl formate to methanol using hydrogen and a ruthenium catalyst re-engineered from Ru(bipy)3. More precise this reaction did not require solvent , took place at 80°C / 10 bar with 0.01% catalyst loading with complete conversion at 980 TON. A catalytic cycle was constructed with many hints from the Milstein paper with two ingoing equivalents of hydrogen and two outgoing equivalents of methanol for each catalyst site. Note how the bipyridine group donates a proton by temporary dearomatization. 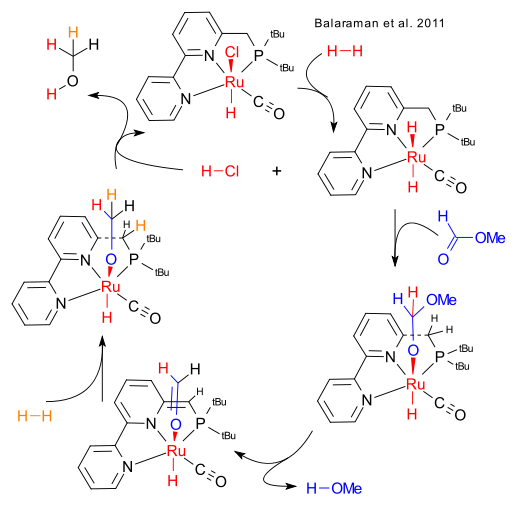 The second methanol molecule popping out appears to carry hydrogen atoms from 4 different parents. Blame this blog not Milstein. And by the way, what has methyl formate to do with carbon dioxide? The reaction of carbon dioxide and hydrogen and methanol to metyl formate is a known process. In fact the industrial production method for methyl formate is a H2/CO reaction. A tandem sequence involving carbon dioxide , hydrogen and methanol to form more methanol has suddenly become less exotic.